When it comes to unclogging a drain, trust the professionals! Almost every home has had a backed up drain before. You’re brushing your teeth and you notice the sink is slowly filling without the plug being in. Or you’re taking a shower and notice the water filling up around your feet. 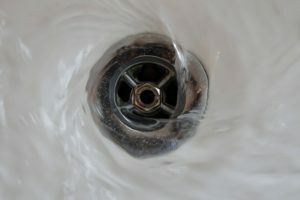 Most of us have spent our lives being advertised to, so the solution seems easy: run out and get a bottle of drain cleaner to pour down the drain and break up that clog. Unfortunately, nothing is ever that simple, and the truth is that sometimes those drain cleaners do more harm than good. Drain cleaners and de-cloggers do usually break up most clogs because they are full of caustic chemicals. These same chemicals can also damage your pipes, even in the bottles that say “safe for pipes” on them. This is especially true if you have to use these cleaners more than once. Your better bet is to call your plumber. If you absolutely must try to fix it yourself, there are some things you can try. If you’re looking for a solution in a bottle, try all-natural, enzymatic cleaners. These use enzymes to break up organic matter that’s clogging drains. They can help with small clogs, but really tough, big clogs will need something else. You may be able to dislodge the clog with a drain snake or a cup plunger. To use these, you have to pull the stopper all the way out, which may actually be the cause of the clog (easy fix!). A cup plunger pushes water through the drain to dislodge small clogs. The plumber’s snake or drain snake (also called an auger) is a thick cable you feed into the drain to push the clog through. For really big or really stubborn clogs, your best bet is to call a professional. Prevention is better than a cure, so make a plan to do monthly maintenance and drain cleaning on your drains. You can use enzymatic cleaners, hot water, or baking soda and vinegar to clear the pipe walls and keep them running well. If you want to avoid clogs in the future, be careful what you put down your drains through the sinks or the toilets. Never put FOGs (Fats, Oils, or Grease) down the drain, instead let it harden in a can and throw it away. You also should not put egg shells, bones, starchy foods, or fibrous foods down the drain (even with a garbage disposal), and you should not flush feminine products, paper towels, tissues, or wipes (even “flushable” ones). Finally, do your best to keep hair out of your pipes by putting drain strainers in your drains. Dealing with any plumbing concerns that require a professional to step in? Struggling with an absolute plumbing emergency that can’t wait? Let B&D Plumbing know. B&D Plumbing Inc. services the greater Washington D.C. metropolitan area, including Maryland and Northern Virginia. Get in touch with us by calling (301) 595-1141 or follow us on social media including Facebook, Twitter, LinkedIn, and Pinterest. As a small, family-owned business, we understand how important your home is—and we offer exceptional service that matches! This entry was posted on Thursday, April 4th, 2019 at 4:13 pm. Both comments and pings are currently closed.